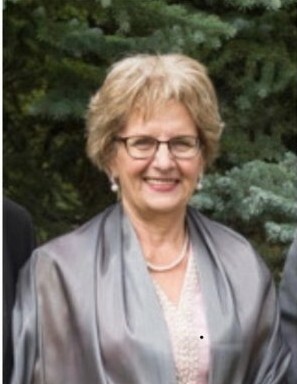 The sudden and unexpected death of Geraldine Caroline (nee Frank) Mueller, 78 years of Humboldt, passed away on Friday, November 23, 2018 at Royal University Hospital. Gerri was born on July 8, 1940 to Louis and Hilda (nee Albers) Frank at Muenster. She attended Ives School until grade 8. Gerri loved school, but due to family commitments had to postpone her interests. She did get back to her love of learning by participating in courses at St. Peter’s College. Eventually, she attained her GED, and her status as an interior designer through a home correspondence course. As the kids were growing up, demands for Gerri’s time were ongoing. She served on the figure skating, minor hockey and dance club executives. Countless hours of sewing costumes, playing music and organizing were logged over the years. Another big project Gerri helped out with was planning, building and launching the great facility known as the Uniplex. Gerri also fought hard to keep the Leo Parker Arena up and running as she believed Humboldt needed two arenas to make more ice time available for both hockey and figure skating. Gerri was also instrumental in bringing a hockey school to Humboldt from Prince Albert. She was also involved with the beginnings of the Humboldt Fair. Once the kids were older, Gerri took on a new business. She bought a computerized embroidery machine and set up a company called Gil-Crest. The operation was eventually sold, but still exists in Humboldt (in its current incarnation as Monico). She was always busy. If not curling, golfing, or bowling, she would be busy cooking, baking or sewing. Gerri also found a love for art and painted many beautiful pictures that she displayed proudly. Her role as a mother started young and she took pride in having large gardens and home cooked meals and treats to keep her family healthy and happy. It was always very magical how Gerri could whip up a full meal from an empty fridge. The kids always were in amazement of how that happened. If there was anyone who lived life well, it was Gerri. She was always there for everyone, taking pride in her appearance, and always had a smile with her infectious laugh for everyone she met. She was always positive and happy. Len and Gerri were married on September 25, 1961 and were blessed with 57 very happy years together. They were an amazing team, whether it was working, traveling or just being together quietly at home, they were content with each other. They were great role models for their family and friends. Gerri was the happiest when the grandchildren and great grandchildren started to arrive. She was described by her family as the “best nana”! Gerri will be sadly missed and lovingly remembered by her husband of 57 years LEONARD Mueller of Humboldt: six children, 22 grandchildren and two great grandchildren: Gordon (Kendra) Mueller of Humboldt, and family Mackenzie (Justin Grywacheski and son Tyce), Mitchell and Madison all of Humboldt; Michelle Mueller (Mike Remenda) of Lloydminster, SK and family Stephen (Angela) Remenda and daughter Brynn of Prince George, BC, Jesse of Calgary, Kyle (Stephanie) and son Owen of Calgary, AB and Brant (Monique) of Pasedena, California, USA; Lisa Mueller (Allan de Paiva) and family Rawdon, Max, Shaye, William and Karis all of Calgary, AB; Karen (Richard Kelln) and family Samantha, Nicole, Alena and Jessica all of Toronto, ON; Regan (Melanie Snook) Mueller and family Koen, Kiley and Klaire all of Seattle, WA USA; Lenny Jr’s daughters: Alexa, Shae-Lynn, Sabrina and their mother Lisa Mueller all of Saskatoon. Brothers and Sister: Allan (Brigid) Frank and great nephew Cameron Frank all of Oshawa, ON, Ron (Phyllis) Frank of Humboldt, Jean (Myles) Heidt of Saskatoon and Cliff (Pam) Frank of Humboldt; numerous nieces, nephews and members of the Mueller family. Gerri was predeceased by her son Lenny Mueller Jr.; parents Louis and Hilda Frank and step mother Frieda (nee Bernhard) (Brinkmeier) Frank. A Public Visitation was held on Friday, November 30, 2018 at Malinoski & Danyluik Funeral Home Hwy #5 East Humboldt from 4:30 p.m. to 7:00 p.m. A Funeral Mass was held on Saturday, December 1, 2018 at 10:30 a.m., celebrated by, Fr. Joseph Salihu at St. Augustine R.C. Church Humboldt. Interment followed at Assumption of our Blessed Mary Roman Catholic Cemetery in Marysburg, SK. Memorial donations in Gerri’s memory can be directed to St. Elizabeth’s Ladies Auxiliary Centennial Cardiac Endowment (cheques made payable to Humboldt District Hospital Foundation). A beautiful life that came to an end, she died as she lived, everyone’s friend. In our hearts a memory will always be kept, of the one we loved, and will never forget. Cheques made payable to Humboldt District Hospital Foundation.